We’re excited to have you join us for our Grand Opening weekend with performances by Cirque-Tacular on January 8 and An Acoustic Evening with Travis Tritt on January 9. Both events are SOLD OUT! There hasn’t been a crowd like this at the theatre in more than 30 years. Whether you’re joining us for one show or both, we’ve put together some tips below to help make your visit to the newly reopened Peoples Bank Theatre a memorable one. 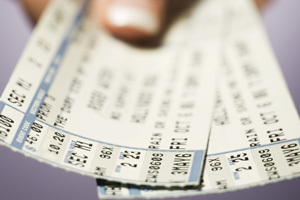 1) Switch your tickets from Will Call to Print-at-Home. Call the Box Office at 740-371-5152 or email tickets@nullpeoplesbanktheatre.com with your ticket order confirmation number to switch your Will Call tickets to Print-at-Home tickets. 2) Pick up your tickets ahead of the show. Beginning January 6, you may bring a photo ID to the Box Office Wednesday, Thursday, or Friday between 10 a.m. and 2 p.m. to pick up your ticket(s). If you cannot pick up your tickets until the day of the show, the box office will open at 5 p.m. Friday and Saturday. While Peoples Bank Theatre does not have its own parking lot, there are six lots within a short distance of the theatre, in addition to on-street parking throughout downtown Marietta. 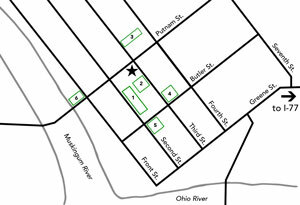 Our online Parking Map shows the location of parking lots available to Peoples Bank Theatre guests for evening events. Most are within one block of the theatre, which is located at the corner of Putnam Street and Third Street. Looking for dinner before the show or a drink afterward? 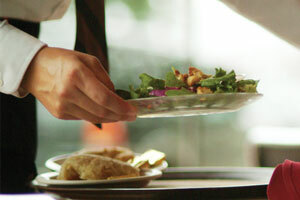 From pub fare to fine dining, Marietta restaurants serve up a mixing pot of American favorites and international cuisine to suit every palate.The Marietta-Washington County Convention and Visitors Bureau has an online dining guide to help you explore the many options available. Please download and complete the Oklahoma! Audition Form and bring a copy with you to your audition. Hipp Stage Productions announces OPEN AUDITIONS for its summer theatre production of Rodgers & Hammerstein’s Oklahoma! at Peoples Bank Theatre. Auditions take place at 3 p.m. January 31 and 7 p.m. February 1. Call-backs will begin at 7 p.m. February 2. At 8 p.m., there will be a dance call for ALL those auditioning. All auditionees should arrive wearing comfortable clothing that is appropriate for movement and closed toe shoes. Dance attire and shoes are preferred, but not required. We are looking for a cast of 30 adults and 4 children. The musical has 9 leading/featured roles: Laurie and Aldo Annie (20s), Curley and Will Parker (20s), Aunt Eller (50-60), Jud Fry and Ali Hakim (30-40s), and Andrew Carnes and Ike Skidmore (50-60s). Six men and six women of the 20 numbered Ensemble have to dance or show a propensity to dance. As stated AUDITIONS take place on January 31st and February 1st with call-backs on February 2nd. at the Peoples bank Theatre in Marietta. Acting and music rehearsals will begin at the end of February/early March; dance rehearsals will begin at the end of March/early April. Performance dates are June 10-12 and June 17-19. “Chorus #2 Ladies” (84-95) Try to learn the melody (top part) and at least one other part; however, having this section learned before the audition is NOT required. If needed, we will assist you at the audition in learning a short section of this part-singing example. https://peoplesbanktheatre.com/wp-content/uploads/2015/12/feature-oklahoma.jpg 200 300 Drew Tanner https://peoplesbanktheatre.com/wp-content/uploads/2017/04/pbt-logo.png Drew Tanner2015-12-21 11:33:412016-02-02 09:44:57OPEN AUDITIONS: Oklahoma! After 30 years of a silent stage filling the empty expanse of the Hippodrome in Marietta, new life and light have been brought back to the historic theater. Now known as the Peoples Bank Theatre, the combined seating of the balcony, mezzanine and auditorium will soon welcome more than 900 people to enjoy stage acts ranging from Vaudeville acrobatics to country music solos and comedians. The grand opening is now only three weeks away, a culmination of decades of work for some. 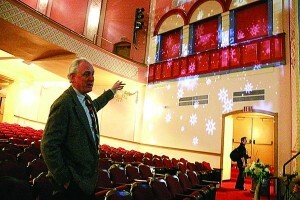 Hunt Brawley, director of the Peoples Bank Theatre, explains the final acoustic needs of the building Tuesday as preparations conclude for the January opening. Built in 1919 as the Hippodrome, the theater at the corner of Third and Putnam streets was, in its heyday, home to vaudeville acts, off-Broadway plays, magicians and silent films accompanied by a five-piece orchestra. Thirty years later the theater was transformed into the Colony Cinema with a colonial facade replacing the original stone archway at the entrance of the hall. The film venue stayed open for an additional 36 years before closing its doors in 1985. But eager to bring the life and light of the arts back to Putnam Street, Dan Stephan Sr. purchased the theater in 1988 with the hope of preserving and restoring the historic landmark in Marietta. At the time his family owned the building currently housing Peoples News next door to the theater. The facade of the restored Peoples Bank Theatre. Stephan helped to form the Hippodrome/Colony Historical Theatre Association with Brawley in 2000 as a nonprofit raising money to restore the historic Marietta landmark. Then in 2004 he donated the building to the nonprofit and over the next decade the group worked to repair the roof, fire curtain, rebuilt the stairways and other structural elements and cleared the building of asbestos-a $2 million endeavor. The final nudge to push renovations into high gear was an investment of $3.7 million from Peoples Bank in 2014. Construction and the remaining renovations to the building, including new seating in replica of the original house seats and a new stage and rigging cost the nonprofit an additional $5.5 million. According to Brawley the overall cost of the renovation was $7.5 million. With the final construction and renovations wrapping up Brawley said some acts have been booked six months out and his staff is working to fill the gaps in weekends between each major performance. Brawley said the variety of acts to hit the stage beginning Jan. 8 should offer entertainment for any audience. As the first band to enter the orchestra pit in the Peoples Bank Theatre, Laura Evans and Company, a jazz and adult contemporary group based in Charleston warms up prior to a private event at the theater Tuesday. Jeri Knowlton, executive director of the Marietta-Washington County Convention and Visitor’s Bureau, said she is anticipating an increase in tourism in Marietta thanks to the opening of the theater. Knowlton said she is especially excited to attend the Travis Tritt solo show during opening weekend. Knowlton, who also attended an appreciation event last weekend at the theater, said the acoustics in the building will make the show worth the wait.